After gaining generic Docker support in July 2014, Amazon Web Services (AWS) now added "Preconfigured Docker" as a new category of supported platforms to its platform as a service offering AWS Elastic Beanstalk. This category of platforms is based on the recently added official repositories for language stacks on the Docker Hub Registry. 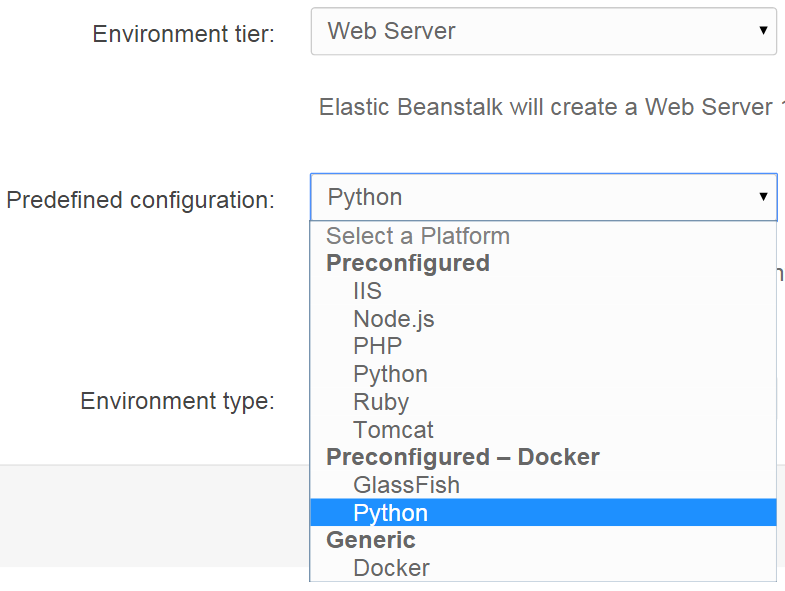 The 'Preconfigured Docker'; platforms are delivered as Docker containers allowing you to develop and test your applications locally using the same container that your application will be deployed to on Elastic Beanstalk. Similar to most other supported runtimes, the provisioned Elastic Beanstalk environment resources for preconfigured Docker containers can also be customized by means of configuration files to integrate additional AWS services like Amazon DynamoDB or Amazon Kinesis. A getting started walkthrough illustrates the well-known simplicity of this Docker enabled development workflow. The resulting image can then be deployed like any other Docker container using the Elastic Beanstalk console or the recently updated Elastic Beanstalk command line interface. Additional deployment instructions can optionally be provided in the Elastic Beanstalk specific Dockerrun.aws.json configuration file. Initially supported preconfigured Docker container types are Python 3.4, Java 7 GlassFish 4.0 and Java 8 GlassFish 4.1. While it seems conceivable that Elastic Beanstalk might switch to Docker as its default runtime one day, it's worth noting that the Java 8 Tomcat 8 stack released at the same time is still delivered as a dedicated container type rather than a preconfigured Docker container. Amazon's Chief Evangelist Jeff Barr recently hinted towards a pleasant surprise regarding Docker usage on AWS to be revealed during the currently ongoing AWS re:Invent. More pronounced Docker support on AWS up to a dedicated service similar to Google's recently announced Kubernetes based Google Container Engine (GKE) might be revealed in Werner Vogels' keynote today (update: watch the Amazon EC2 Container Service (ECS) announcement at 45:27 into the keynote). 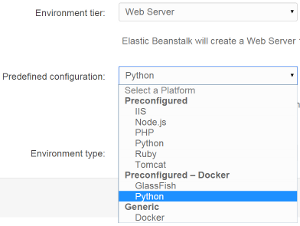 The Elastic Beanstalk documentation features a developer guide including a section on deploying preconfigured Docker containers and the API reference. The preconfigured Docker images are available on the Docker Hub and the source code can be accessed on GitHub. Support is provided via the Elastic Beanstalk forum.